Where the hell are my superpowers? As Matt frequently reminds me, it’s now nearly five years since I started to work on “The Archbishop”, more formally known as BMNH R5973, the Natural History Museum’s long-neglected Tendaguru brachiosaur. This is, or at least once was, one of the most complete brachiosaurid specimens ever discovered — although quite a bit of the material has gone missing or remains unprepared. It’s true that I owe the world a proper description, especially since I spoke about the specimen as long ago as the 2005 SVPCA (Symposium of Vertebrate Palaeontology and Comparative Anatomy) and have been sitting on it ever since. So: you have my apologies, along with a promise to get into gear RSN. 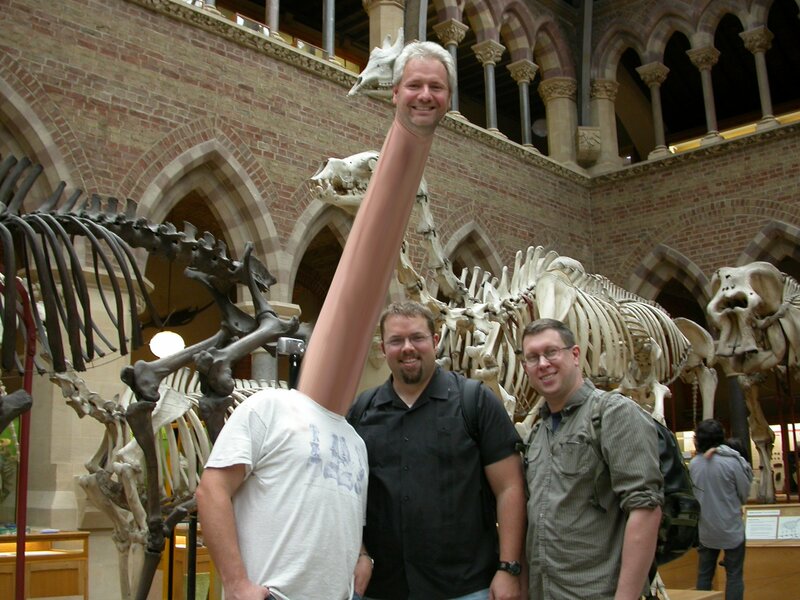 Left to right: Mike with brachiosaurid superpowers, Matt with no superpowers, Darren being mundane. Better still would be the ability to crush my enemies to dust beneath my Mighty Forefeet of Justice. And yet, so far, nothing. It doesn’t seem fair somehow. 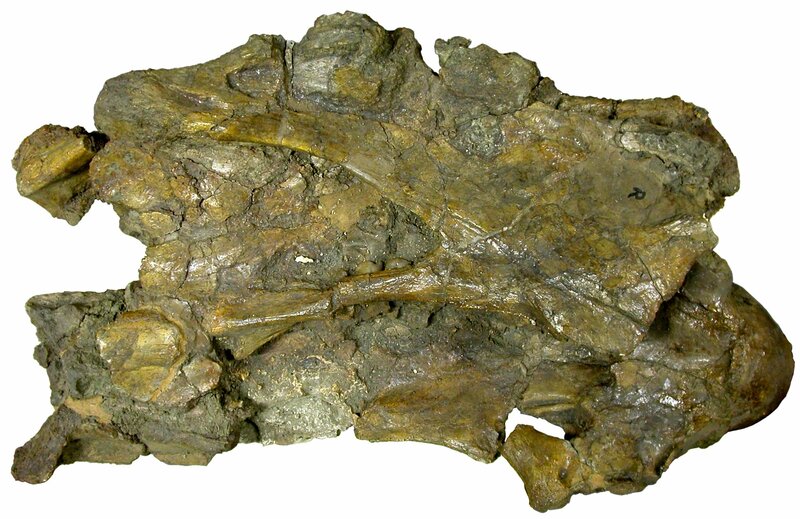 Tendaguru brachiosaurid BMNH R5937, "The Archbishop", cervical U in right lateral view. Copyright the Natural History Museum, since it's their material. 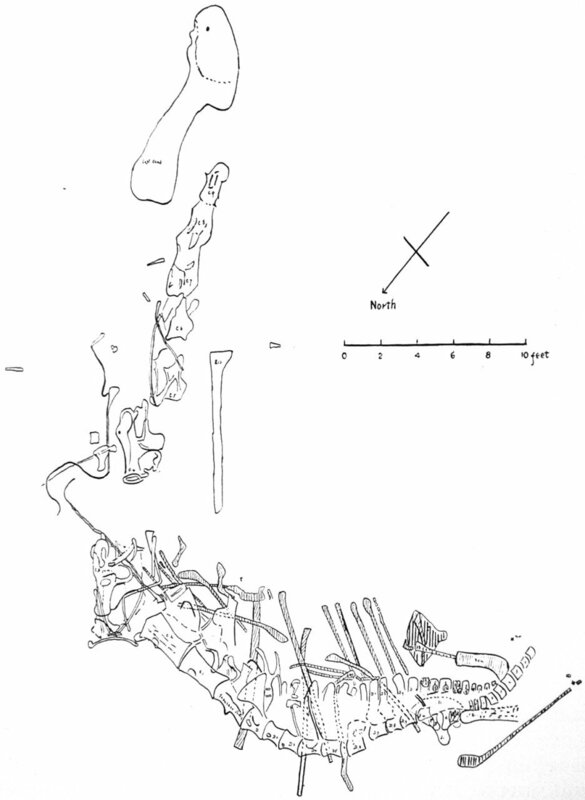 When it was found in 1930, in an expedition to Tendaguru, Tanzania, led by F. W. H. Migeod, the Archbishop consisted of an articulated vertebral column all the way from cervical 5 through to caudal 8 or so — by far the best vertebral sequence of any brachiosaur — along with cervical and dorsal ribs, a scapula, both humeri, pelvic elements and a partial femur. At least, if you believe Migeod; but the material that made it back to London, survived the Second World War and has been prepared is a fraction of that: five cervicals in various states of repair, some cervical ribs, two excellent dorsals (featured previously, though not in a big way), two further dorsal centra and a dorsal neural spine, an indeterminate long-bone fragment and a smushed proximal pubis. Migeod measurements make it seem unlikely that all the material really belongs to a single animal — for example, the humeri seem much too short — but the articulation of the vertebrae makes their associated pretty rock solid. And that is plenty enough to make this an awesome specimen. I don’t want to say too much more about the Archbishop for fear of stealing my own thunder, but it’s no secret that I don’t think it’s Brachiosaurus brancai. For those who want to know more, the slides from my 2005 SVPCA talk are available. Enjoy! Taylor, Michael P. 2005. Sweet seventy-five and never been kissed: the Natural History Museum’s Tendaguru brachiosaur. p. 25 in Paul M. Barrett (ed. ), Abstracts volume for 53rd Symposium of Vertebrae Palaeontology and Comparative Anatomy, The Natural History Museum, London, 7th-9th September 2005. 41 pp. Never mind the superpowers, you’re just lazy, like me. Will poor Darren _ever_ get over that slight? For me, having half your energy, Darren, would be a superpower. I sure hate to hear of unprepared sauropod bones wasteing away in museum storerooms! Do you know of any plans to get this stuff prepped? Perhaps BMNH could provide housing for a top-notch sauropod preparator to bring these bones into the light of day (or collection room)…. To steady your camera, get a screw that fits in the tripod mount hole. Tie a string to it about as long as you are tall, and tie a loop in the end. For extra convenience, wrap tape around the looped part to hold it open. When you need to keep the camera steady, insert your boot toe into the loop and use it to hold the string taut. If you take pictures from various postures, add loops so you can steady it at any height above your foot. If you need a superpower, get Darren. Darren counts, personally, as a superpower. That thing has been moldering for something like 1e8 years. Anybody who can’t stand to wait 0.000005% longer for a description needs to find a different line of work. Hi, Virginia, good to hear from you. I am afraid there is a lot of unprepared material at the NHM — the last I knew there was only one preparator for the entire fossil collection. We are still hoping to get more of the Archbishop jackets opened, but the last one was very disapointing — it was supposed to contain part of a scapula, but there was no way to identify the contents beyond the level of “flat bone surface”. So it’s not easy to get the remaining jackets prioritised. All the more frustrating since according to Migeod’s preliminary description, some of the dorsal neural spines are bifid! x-ray vision so you could look inside the unprepared jackets and see which ones have the bifurcated neural spine bearing vertebrae so you could get them opened first. And in the real world it seems like it would be worth getting the jackets CT scanned to see what is in them. Now all you need is someone with an industrial CT scanner who would let you scan them for free in exchange for the free publicity. I hate to bring this up, but that first picture does not look wholesome. Not at all. Errr, I don’t know how accurate that quarry map is, but that scapulocoracoid is a whopping 11.5 feet long. Isn’t that quite a bit larger than in the mounted Berlin Giraffatitan? Excellent point. Amazingly, it hadn’t occurred to me. Curtice et al. (1996: table 2) give measurements for several brachiosaurid scapulocoracoids. The longest scapulocoracoid lengths are 2500 mm for BYU 9462 (“Ultrasaurus“) and 2430 mm for HMN Sa 9 (Giraffatitan). I measure Migeod’s quarry-map scapulocoracoid at 334 pixels; and his 10-foot scalebar at 290 pixels, or 29 pixels per foot. If correct, it would make the element 11.5 feet long (as you said), which is 3.5 m. That’s fully 40% longer than the current record, which — how shall I put it? — strains credulity somewhat. Clearly I should get my finger out and write the long-overdue description. I feel really bad about having stalled on this for so long (though I do at least have the excuse that it’s because of other useful work I’ve done rather than sheer laziness). The good news is that two other long-standing projects have finished or are finishing this year (the neck-anatomy paper in PeerJ, and the forthcoming Wedel-led paper in PLOS ONE on caudal pneumaticity), and that really does leave the Archbishop at the very top of my TO DO list. « Behold the righteous wrath of SV-POW!